One of the key components to tailoring your home with a retro sensibility is to embrace some of the big, bold colours that have gone by the wayside. This can take the form of the bright pastels of the 1950s, the wild mix-ups of the 1960s, or the clashing bolds and print patterns from the 1970s. Utilising these rarely seen colour palates can be the first step to sending your home back in time. However, one word of caution: keep your colours within a narrow range. Having too many colours can quickly muddy your home’s interior and make it look uncoordinated. Keep one or two key colours in mind and build from there. Many modern homes eschew prints, except for a black-and-white motif perhaps, in favour of monotone muted colours. However, when going retro, it is important to keep prints and patterns in mind to complete the look. Look for inspiration in the chequered tablecloth patterns from 1950s homes or the circular shapes of wall art and furnishings from the 1960s. Don’t be afraid to dabble with patterns, but remember to keep your patterns uniform and offset by bold solids so your interior doesn’t look too busy. Most modern furniture is angular and straight edged compared to the rounded and curved furniture from decades past. However, a savvy shopper can add some retro pieces that capture the mood of bygone years. Look for circular coffee tables and round-backed chairs that give that subtle retro feel. 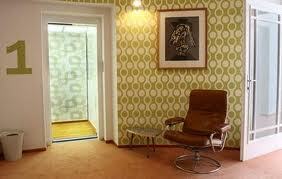 Most interior designers would shy away from using only retro furnishings and colours to decorate a home. Some retro elements work but, as with all things, only in moderation. Most decorators are going to blend more minimalist modern styling with bolder retro furnishings. Use your retro pieces as centrepieces or accents to brighten up rooms, while the more modern items can serve as anchors so people aren’t wondering whether they’ve inadvertently stepped back in time. With the help of a local electrician you can easily create a retro look with just a few wall sconces and choice lighting patterns. This can offset the cost of those expensive retro pieces and furnishings. Going retro isn’t as costly as many people think. Instead of spending thousands of dollars and endless hours shopping at antique stores, a few well-chosen pieces and designs are all you need to give your home that retro look.